Structured cabling is the digital plumbing for your business or home. The cabling upgrades the typical one run of telephone or television cable access and allows for flexibility within the entire structure. In essence, wiring your home for today’s technology and tomorrow’s advancements in technology. This is great for both the home and commercial visual and audio systems. Structured cabling & wiring provides an organized method and ease of use for the present and future for any changes or additions to your Internet, Telephone and Audio & Video connections. Connection color coding, along with provided documentation takes the frustration out of future changes. All cabling and layout is done in accordance with the TIA-568A/B wiring standards. 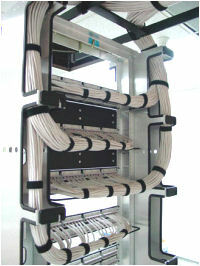 Texas Info Media designs, installs and documents the entire structured cabling system. From start to finish, we handle all your needs from cabling to components. This provides you with ease of use now and in the future. Our structured cabling system installation is available for homes and businesses around the world. If you are interested in getting your the cabling in your home or business organized and ready for the future, contact our team today.